Let’s face it. Compared to a motorcycle a car is like a living room with near limitless opportunities for storing unsecured luggage. Most riders prefer not to carry anything on their backs allowing greater control and freedom of movement especially on longer journeys. Glove compartments and under seat areas are usually tiny. Pannier systems offer the highest volume but require the fitting of racks and they’re not cheap either. Tank bags are popular because they’re easy to access and you can see them. However, a well secured tail bag also has many advantages and there are many different types to choose from. For me, the Oxford Lifetime T40R Tailpack is the best all-rounder. It has a deceiving 40 litre capacity, outside pockets, quick removal and multiple carrying options. For smaller loads I like the convenience of the Kappa Light Range LH203R Expandable Mini Tail Bag. It’s a neat, out of the way and streamlined option. Depending on its size, we may wish to store anything from light personal possessions to clothes and equipment. A small tail bag is ideal for items that won’t fit in our jackets, pants or glove compartments such as small tool bags. Larger models sit half on the mounting panel and half on the rear seat. They more resemble small sports bags and have a greater storage volume. Imagine finishing your journey and dismounting only to discover that you’re tail bag is… gone. And along with it whatever you had placed inside. A bigger issue is the safety risk posed from a poorly secured bag which can slip into the chain and rear wheel area causing a high-speed lock-out. Some tail bags are instantly detachable while others are more permanent fixtures requiring a few minutes to unthread the mounting straps. Perhaps you only wish to add and remove the contents rather than the whole bag so decide on what’s best for you. Detachable bags usually have a base permanently attached to a mounting plate. The main part of the bag can then be detached by unclipping crocodile clips or a surrounding zip. Whatever method is used safety comes first and a well secured tail bag must also allow control and stability to be maintained at all times. This is a particular concern with large or heavy loads. It is important to ensure that the straps used to mount the bag really do their job. Some require an elaborate weaving through slits and eye holes. If threaded incorrectly they can easily work free and loosen to the point of danger. Dangling ends should be tied off or folded back where they won’t flap in the wind and undo. Give the bag a good, firm shake and check regularly during fuel stops or breaks that all is well. An insecure bag is a risk not just to you but to other road users. Some bags are waterproof and others are not. A few models offer a pull-out cover option to protect it from the rain while on the move. Check your choices with the manufacturer to confirm. Unless it’s locked into position then yes, your bag or its contents are unsafe when not attended to. Fixed mountings are better as only the mount can be stolen unless screwed or bolted into position. Avoid storing mobile phones, passports or other important items behind you and out of sight. From heavyweight British manufacturer, Oxford, the Lifetime offers a bit of everything. Firstly, it is detachable. It has a firm carrying handle and can also be used as a back pack… and a roomy one too with a volume of 40 litres. The bag isn’t described as waterproof but it does have a waterproof interior section for keeping the important stuff bone dry. Expansion areas allow for extra storage along with many other pockets and compartments. The main method of attachment to the mounting is by surround zip. For its volume, the Oxford Lifetime is relatively compact, aerodynamic and can be well secured to the rear of the bike. 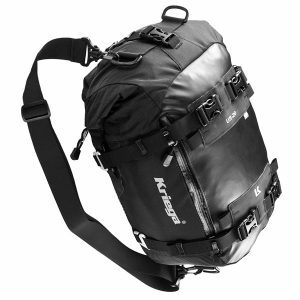 The Kappa Light Range LH203R Expandable Mini Tail Bag is deceivingly useful. Don’t worry that it’s not immediately detachable… it’s harder for a thief to remove too. The detachable shoulder strap may not be much use unless you only buy it to wear over your shoulder or are strong enough to carry the bag and the attached motorcycle over your shoulder too! Otherwise you have some lengthy removal and replacement sessions ahead of you. A well-secured and difficult to remove tail bag is best left where it is and the Kappa comes into its own as a small, low-profile but handy storage bag for a multitude of items. The bag extends easily to increase its volume from 5 to 7 litres. 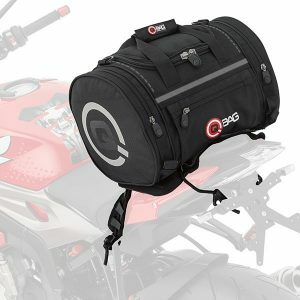 The QBag Waterproof Roll Bag 3 does pretty much what it says on the tin. 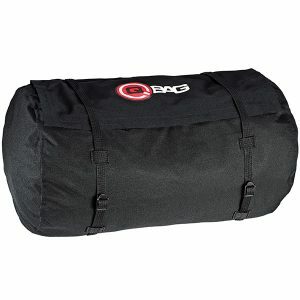 At 50 litres it’s a large volume soft bag and fully waterproof. This makes it ideal for sleeping bags, clothes and other soft items but anything heavy is likely to move around unless strategically packed inside. The two surrounding straps are adjustable to help tighten the load and make it more streamlined, although you may need some extra bungee straps to attach it more firmly and securely to the bike. The Kriega 20L waterproof tail bag has alloy fitting hooks and comes equipped with removable shoulder and waist straps. An anti-slip mesh base also doubles as a pocket to store the shoulder and waist straps when the US-20 is attached to the bike. The bag can be removed with four quick release buckles and it also allows ‘stacking’ – the secure placement of smaller models on top. The Tail Bag 4 is a more sturdy option if you prefer cylindrical shaped designs. This model allows heavier goods inside without risk of displacement or shifting loads. It has 3 external zip-up pockets including a large compartment at either end. The securing straps are simple but efficient allowing a quick attachment and removal. With a 40 litre capacity it is handy for gym gear, clothes and plenty of accessories for mini-trips. Tail bags can be used to compliment other forms of luggage storage. For example, some riders like to store items in lockable panniers and use a removable tail bag when leaving the bike unattended. 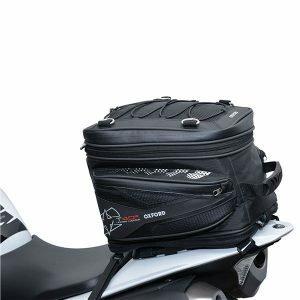 For the rider who prefers as little as possible attached to their beloved machine, the tail bag provides a low-profile and out of the way solution for carrying just the essentials. And if they aren’t quite as perfect as bag-free motorcycling then, as their name suggests, there’s some consolation… you can’t see them anyway!